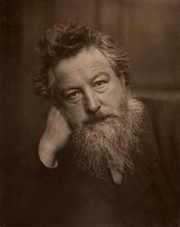 Portrait of William Morris, aged 53 by Frederick Hollyer. This page covers the author of News from Nowhere. For other authors named William Morris, see the disambiguation page. William Morris has a Legacy Library. Legacy libraries are the personal libraries of famous readers, entered by LibraryThing members from the Legacy Libraries group. » William Morris's legacy profile. William Morris's book The Essex Serpent was available from LibraryThing Early Reviewers. "William Morris" is composed of at least 11 distinct authors, divided by their works. You can edit the division. William Morris is composed of 11 names. You can examine and separate out names.